Definition Angulation or rotation of the median longitudinal axis of the external auricle (pinna). Landmarks Inclination of the medial longitudinal axis of the ear from the vertical is measured by placing the long side of an angle-meter along the line connecting the two most remote points of the medial axis of the ear (see section on measurement of ear length). The vertical axis is then established in one of two ways. 1. The most accurate measurement of the vertical is a line perpendicular to the Frankfort horizontal plane (FH), which connects the highest point on the upper margin of the cutaneous auditory meatus (porion) and the lowest point on the bony lower margin of each orbit (orbitale). 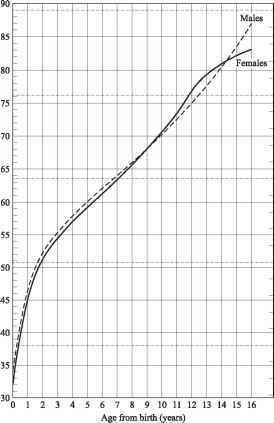 The angle between the median longitudinal axis of the ear and the Frankfort horizontal can be measured directly; however, this value can be estimated from the angle between the vertical axis and the median longitudinal axis of the ear (Fig. 7.63a). 2. The vertical axis can be estimated by imagining a line perpendicular to a line connecting the outer canthus of the eye and the most prominent point of the occiput. Once again the angle of rotation of the ear is that angle subtended between the median longitudinal axis of the ear and the vertical axis (Fig. 7.63b). 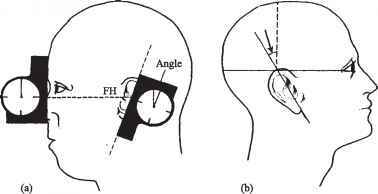 Figure 7.63 Methods of measuring ear rotation angulation. Instruments A special protractor with pointer is the ideal instrument. However, a tape-measure or transparent flexible ruler can be used to define landmarks, utilizing a protractor to measure the angle of rotation. Alternatively, graduated X-ray film can be used. Position Frankfort horizontal, with the facial profile in the vertical. Remarks As in the assessment of ear position, there is considerable controversy about the method of choice for defining ear rotation. Both of the above methods are practical. 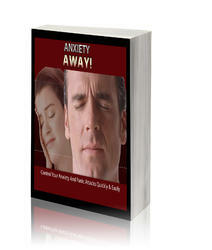 We recommend that the reader choose one method and become familiar with it. Normal rotation is between 17 and 22 degrees (range 10-30 degrees) (Fig. 7.64). Figure 7.64 Ear rotation, both sexes, 6 to 16 years. From Farkas (1981), by permission. How to measure position of ear from canthus of eye to occiput?